One of my dog’s four-legged friends is a Dachshund named Lucy. Some other friends of ours have Dachshunds, too. 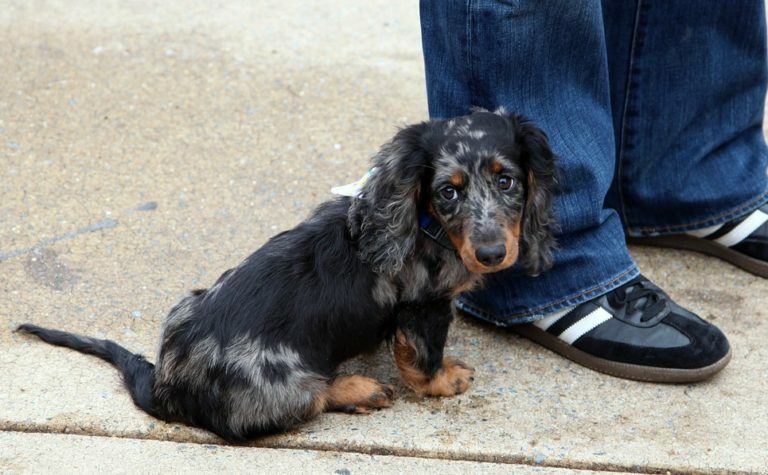 If you’re thinking of adding a Dachshund to your family, you’re not alone. They’ve been a favorite with families for many years — with good reason. But there are also some things you need to know about before you bring home a Dachshund for the first time. So, today we’ll take a closer look at this fun-loving, spirited dog that many people choose for a household pet. 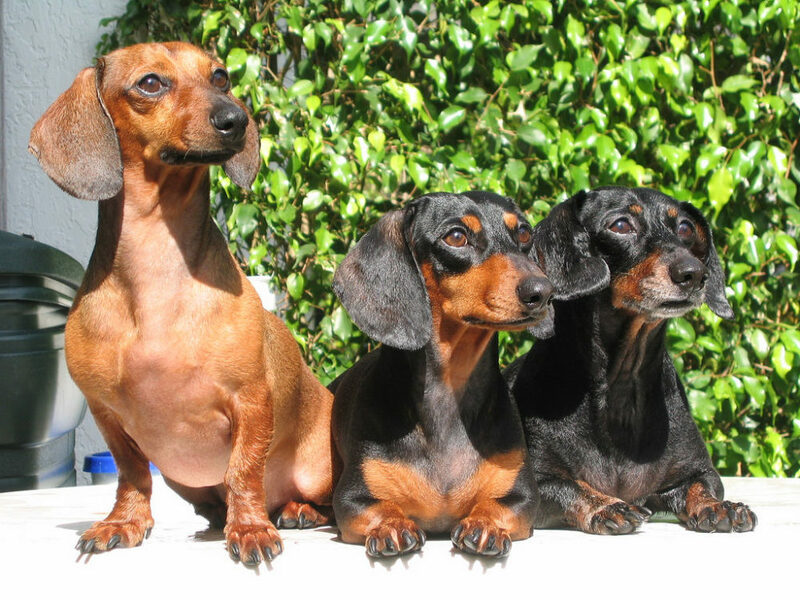 Dachshunds originated in Germany — where they are known as the teckel. The breed’s population fell very low during World War I. However, many Dachshunds were brought to the United States after the war, and their numbers increased dramatically. The long, low body style of the Dachshund was bred for a particular purpose: to flush out rabbits and badgers from their burrows in the ground. The breed’s tenacious spirit allowed it to fight to the death to get their prey. As a result, Dachshunds today have a very strong hunting instinct. They will chase down and kill smaller animals and birds. TIP: By nature a scent hound, a Dachshund spends a good deal of time with their nose to the ground and they like to burrow underneath things, like toys and blankets. 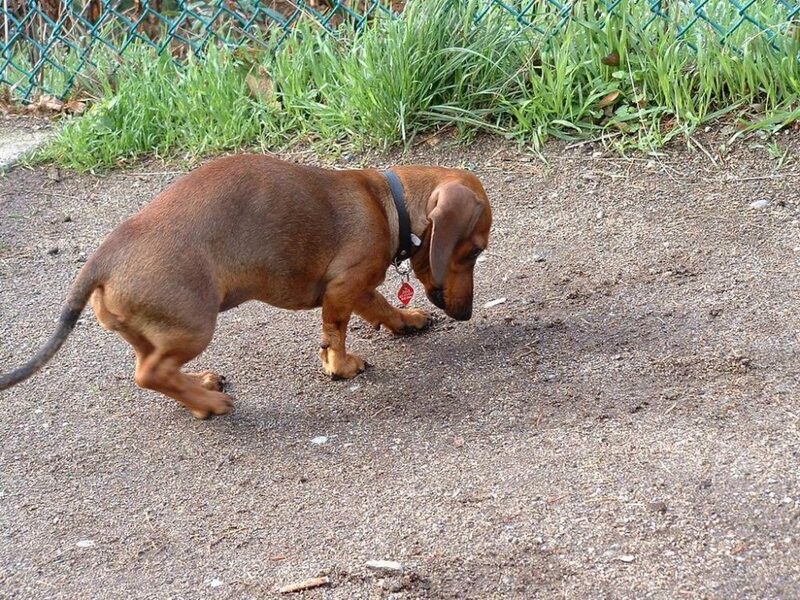 However, they also have a strong digging instinct — which could mean trouble for your yard! Dachshunds are often depicted in comics and cartoons because of their unique appearance and lively nature. The standard type stands 8 to 11 inches tall and weighs over 11 pounds at the age of 12 months or more. The miniature variety is 5 to 7 inches tall and weighs less than 11 pounds at 12 months of age. The toy size may be up to 4 to 6 inches tall and weighs around 8 pounds. The Dachshund’s body is quite muscular, despite its unusual body structure. Unfortunately, that long body and short rib cage make the Doxie’s back relatively weak. The head is long, with a convex skull and protruding brow line. The eyes are dark and almond-shaped. The ears hang against the dog’s cheek. Their deep chest gives a wiener dog a lot of lung capacity, endurance, and a surprisingly deep bark! 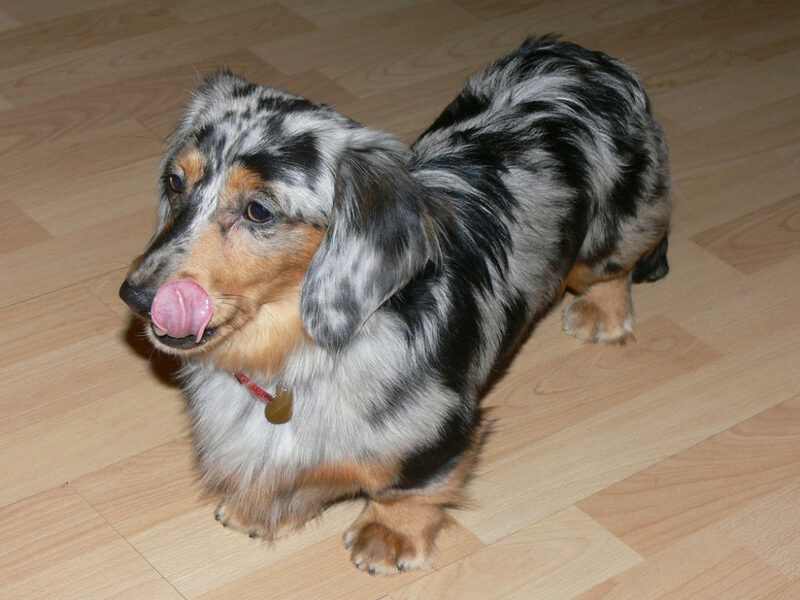 Dapple refers to spots where some of the color has been lightened or removed. As a result, those spots appear somewhat silver-colored. Sable is when black hairs mix with other colors — usually red. For example, red roots and black tips on the dog’s whole body. 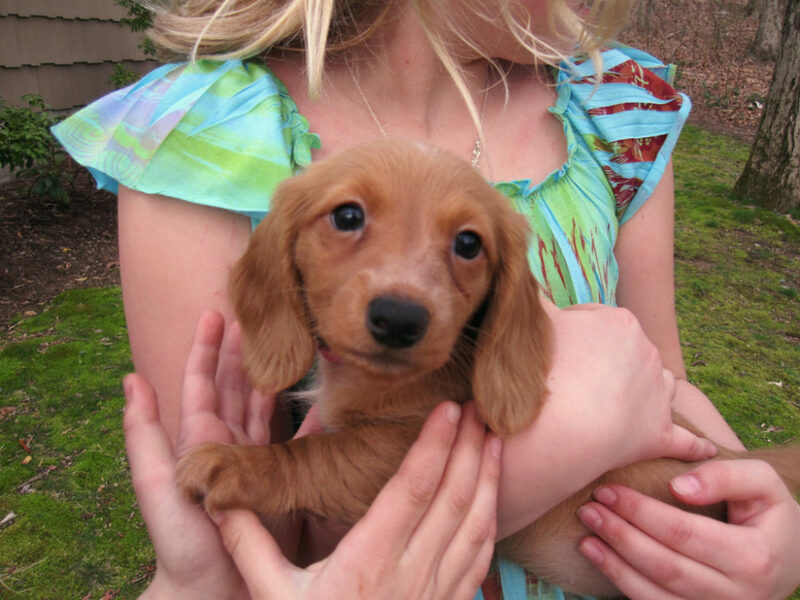 The Sable pattern is most common on red longhaired Dachshunds. Brindle means striped. Even if there is only 1 stripe on a Dachshund dog, it is considered Brindle. TIP: A Dachshund’s distinctive markings are either tan colored or cream colored — and they’re located in the same places on all Doxies: the face, the chest, on all 4 feet, and under the tail. Longhaired Dachshunds need to be brushed daily to keep their coats tidy and matt-free. Wire-haired Dachshunds need professional grooming at least twice each year. Short-haired Dachshunds (or smooth coated Dachshunds) only need to be wiped down with a damp cloth occasionally to keep their coats clean and neat. Dachshunds don’t shed any more or any less than the average dog — they shed just as much as most other dogs do. 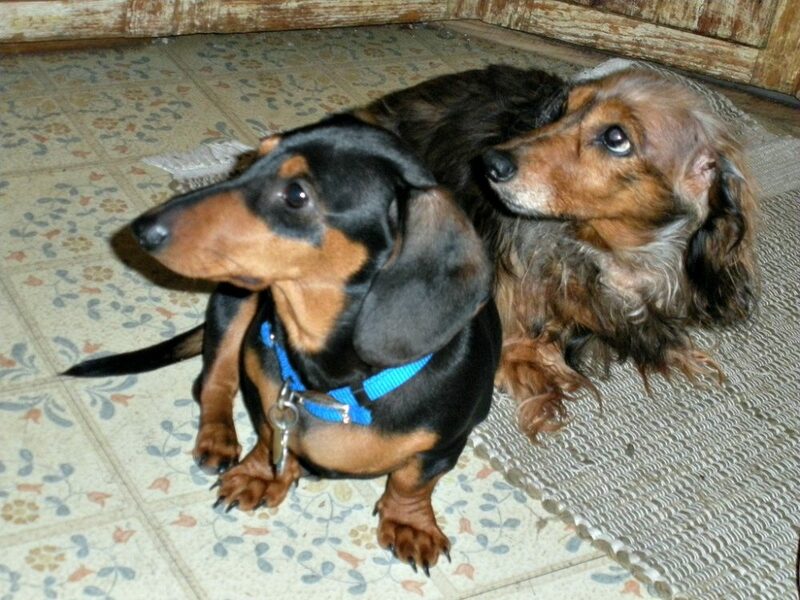 Dachshunds were bred to hunt — so they require regular exercise to keep them trim and muscular. Otherwise, they will rapidly gain weight, which puts unnecessary pressure on their tiny back. In fact, Dachshunds can become quite lazy if not trained to engage in regular exercise. 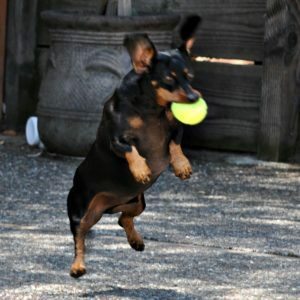 So, your Doxie will enjoy romping around in a safe, open area outside — as well as lots of playtime indoors. 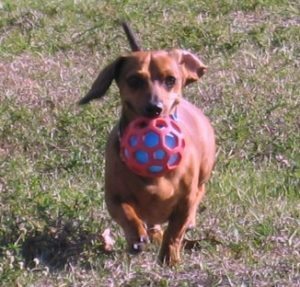 One thing’s for sure… Dachshunds are high-spirited dogs. They are playful, tough, and fearless! Dachshunds typically live from 12 to 15 years of age. Because of the breed’s inherent structure, the Dachshund is subject to back problems — which can sometimes be serious. Protect your Dachshund’s back as much as possible. Seriously, they cannot climb up and down as easily as most dogs can. Prevent weight problems — because extra weight can contribute to intervertebral disk disease (IVD), which affects more Dachshunds than every other breed of dog put together! In terms of other health issues, Dachshunds also tend to experience more cases of diabetes, heart disease, and urinary tract issues than other dog breeds. Mast cell tumors are also common in Dachshunds. People can’t help but smile at the Dachshund’s unlikely build, playful personality, and expressive eyes. These dogs make good family companions and are good with children. TIP: Make sure to teach any children in the home to be especially careful of your Dachshund’s back and to be extra careful to avoid stepping on them. Dachshunds have a lively and independent spirit — which can sometimes manifest itself in stubbornness. In fact, if they are left alone too often, they might suffer from separation anxiety and engage in destructive behaviors, like chewing and digging. Consistent, positive training works well with wiener dogs. Even though they are slow to warm up to strangers (it’s as if they’re often suspicious of them), they do bond well with their owners and other family members. In fact, they thrive on companionship, and many will attach themselves to one person in the family. The best way to get your wiener dog to be more accepting of people in public places is to socialize your Dachshund from an early age. Doxies can be difficult to housebreak, but they will eventually respond to consistent potty training. It may take a little bit more time and patience on your part, but it will work! For fun, personality, and stamina… the Dachshund is a good choice for many households. 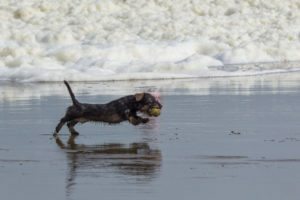 But when it comes to grooming, exercise, and health issues… some families may simply not be ready to accommodate the unique needs of a Dachshund dog.